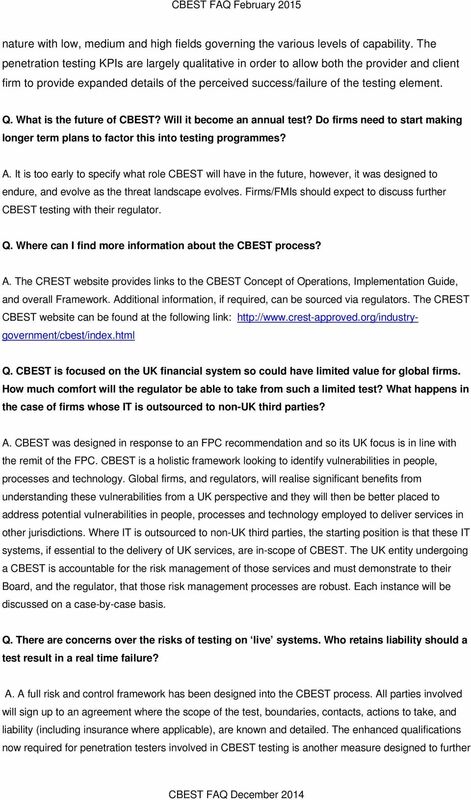 Download "CBEST FAQ February 2015"
4 mitigate the risks concerning damage to live systems. CBEST is delivered in stages and at all times during the testing stages, the firm/fmi is in control of the test and can request a temporary halt at any point if concerns are raised over damage (or potential damage) to a system. Q. What is the likely outcome should a firm receive a poor CBEST report? What action will the Authorities take? A. CBEST is not a pass/fail test. However, identified vulnerabilities will be reviewed by the relevant regulator(s) and may be included in post-cbest remediation plans which are agreed by the firm/fmi and the appropriate regulator. The remediation work is then managed as any other regulatory initiative. Q. What value do GCHQ bring to CBEST? A. GCHQ, as the UK s national security and intelligence agency, has a central role to play in the delivery of CBEST threat intelligence products. With the assistance of GCHQ s intelligence capability, CBEST threat intelligence products will enhance the protection of UK networks from threats in cyberspace, by helping firms/fmis to target their defences. Q. Although the pool of accredited testers is growing it remains small and costs are high. How much does the Bank of England think an average CBEST is likely to cost? A. The cost of the test varies dependent on the threat intelligence and penetration test providers chosen. Some firms already have existing contracts with these providers and therefore can potentially negotiate lower costs. At the time of launch, CBEST was not expected to cost significantly more than industry-leading red-team type tests. For exact costs firms/fmis would need to contact one of the approved providers for a quote. Q. Is the penetration testing methodology used in CBEST accredited by CREST? A. 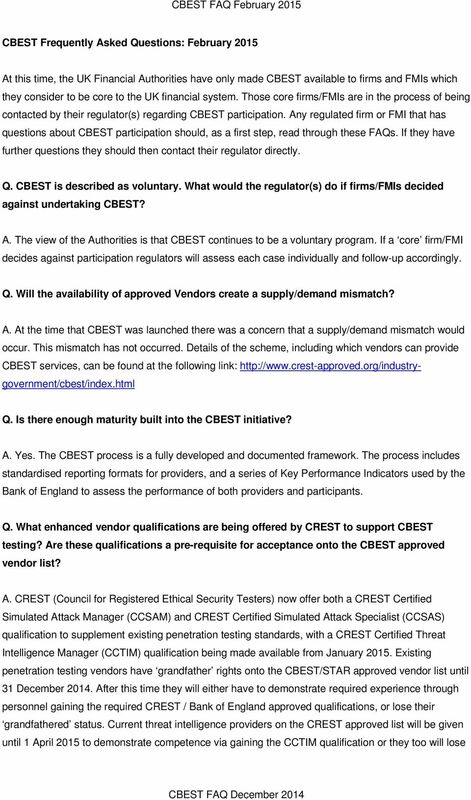 There is no requirement for penetration testing attack methodology used in CBEST to be directly accredited, as, by definition, a CBEST does not deliver a standardised test. The nature of the tests means that they are based upon the modus operandi of real life cyber threat actors. To ensure appropriate standards of proficiency, in testing companies, CREST has worked with the Bank of England to develop the enhanced CREST Certified Simulated Attack Manager (CCSAM) and CREST Certified Simulated Attack Specialist (CCSAS) qualifications. These rigorous qualifications demonstrate ability in testers to adopt the methodology within a safe framework. INTELLIGENCE. RISK MITIGATION. RESPONSE. CONSULTANCY. Cyber Defence Capability Assessment Tool (CDCAT ) Improving cyber security preparedness through risk and vulnerability analysis An analogue approach to a digital world What foundations is CDCAT built on? Rapid Cyber Remediation Response Management. Using the Game-Changing Capabilities from Project Remedies Inc.